Welcome To Baps Kishore Mandel Website NEWS: Jal Jhilani Festival will be held on Aug 30 2003 in Liberty State Park Jersey City NJ at 4:30 NEWS: Janmashtami Celebration Was held on Aug 24 2003 read more about it in the News Section. 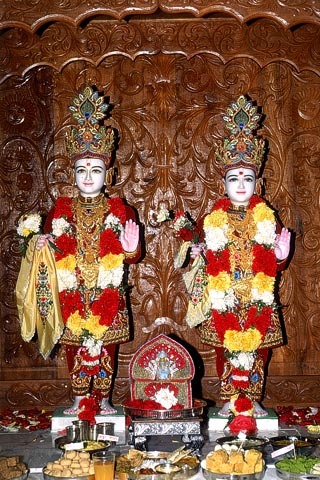 The Bochasanwasi Shree Akshar Purushottam Swaminarayan Sanstha (BAPS), a socio-spiritual organization with its roots in the Vedas, was revealed by Lord Swaminarayan in the late 18th Century and established in 1907 AD by Swami Yagnapurushdas. Currently, P. P. Pramukh Swami Maharaj serves as the spiritual and administrative head. BAPS-JC is a local chapter in Northern-NJ area. The BAPS Kishore Mandal provides a place for youth ages 15-25, to grow stong in leadership, management, musical, and communication skills training in addition to spiritual development. © Copyright 2000-2002 BAPS, Inc.